We are a local group and do not ship. You or a trusted friend must be able to pick up from the Eugene, Oregon area in a timely manner after orders arrive to the warehouse. 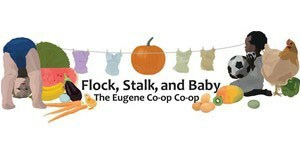 Flock, Stalk & Baby: The Eugene Co-op Co-op, is a local group in Eugene/Springfield, Oregon, dedicated to improving the quality of our families' lives without breaking the budget. We have a robust weekly food co-op, many buys for toys, clothing, baby products, natural products.